[PDF] Literary Advertising and the Shaping of British Romanticism | Free eBooks Download - EBOOKEE! 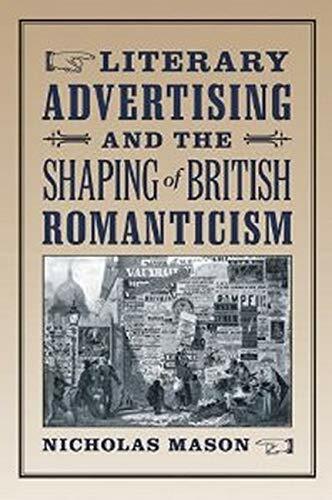 Description: Literary Advertising and the Shaping of British Romanticism investigates the entwined histories of the advertising industry and the gradual commodification of literature over the course of the Romantic Century (1750â€“1850). In this engaging and detailed study, Nicholas Mason argues that the seemingly antagonistic arenas of marketing and literature share a common genealogy and, in many instances, even a symbiotic relationship. Drawing from archival materials such as publishers' account books, merchants' trade cards, and authors' letters, Mason traces the beginnings of many familiar modern advertising methods?including product placement, limited-time offers, and journalistic puffery?to the British book trade during the eighteenth and nineteenth centuries. Until now, Romantic scholars have not fully recognized advertisingâ€™s cultural significance or the importance of this period in the origins of modern advertising. Mason explores Lord Byronâ€™s appropriation of branding, Letitia Elizabeth Landonâ€™s experiments in visual marketing, and late-Romantic debates over advertising's claim to be a new branch of the literary arts. Mason uses the antics of Romantic-era advertising to illustrate the profound implications of commercial modernity, both in economic practices governing the book trade and, more broadly, in the development of the modern idea of literature. No comments for "[PDF] Literary Advertising and the Shaping of British Romanticism".